Home to so many of the industry’s power players, the land of stars and stripes has mountains to offer the world when it comes to interior designers. And just like the vast, diverse country itself, the best thing about America’s leading design exports is that they offer such a broad, assorted mix of iconic styles. From Mr. Michael S. Smith, whose flawless touch is witnessed in the luxurious grey living space above, to the bold and brilliant Kelly Wearstler, discover our round-up of top American interior designers. Who better to kick off our shortlist than the White House favourite, Michael S. Smith? The California-native (who redecorated the Oval Office and the First Family’s private quarters) couldn’t be more at the top of his game. How did he get there? Reading interior design in Los Angeles, before continuing his studies at the Victoria and Albert Museum, was his starting point. On his return to the U.S., Smith nurtured his crafted under legendary antique dealer Gep Durenberger, which gave him two invaluable tools to help build his design empire: a curator’s eye and deep appreciation for the past. His work showcases a beautiful balance of European classicism and American modernism, with projects setting unique furniture and decor finds against the most elegant backdrops. The moment a designer’s work becomes instantly recognisable with one quick glance, it’s a definite sign they’ve conquered the industry. Kelly Wearstler cracked that feat years ago, after establishing her eponymous studio which has grown from boutique interior design firm to global lifestyle brand. This colour-charged living room, taken from one of the creative’s Beverly Hills projects, is a sample of what Wearstler has to offer. With fearless shapes and confident colour schemes meeting graphic art, vintage lighting and a dose of Surrealism, it’s simple to see why her super-creative projects have earned her an A-list clientele from the film and music industries. She’s the queen of Maximalism, obsessed by dramatically oversized silhouettes that mean her work always packs a punch. Martyn Lawrence Bullard is British-born, but since he’s fallen in love with the American lifestyle (he’s lived in L.A. for over 20 years) and become the go-to designer for Hollywood’s hottest celebrities, Bullard had to feature in our round-up. A testament to his range, the creative’s portfolio boasts several different looks, united by an unwavering glamorous attitude and exquisite details. This serene interior demonstrates the designer’s flair for showing off architecture in the very best light, with elegant ivory curtains framing the archways of the space. Filling projects with distinct pieces from all over the world (this room contains finds from Sri Lanka, Morocco – the list goes on…) is another reason why Bullard’s work has such a unique identity. Jeff Andrews orchestrates interiors so breathtaking they’ve earned him possibly the most enviable celebrity client list in the industry. The uber-influential Kendall Jenner and Kourtney Kardashian are advocates of his work, not to mention Kris Jenner, Ryan Seacrest and America Ferrera. What’s his secret to attracting such a powerful following? The international interior designer sets his spaces apart by infusing bold design concepts with a sense of warmth and sophistication to achieve livable luxury, because (even for jet-setting A-listers) there’s no feeling like home. This incredible open-plan living room and dining room from a Lake Tahoe retreat illustrate Andrews’ next-level ability to layer texture, colour and pattern, as well as his clever use of furniture, lighting and mirrors to give the most stunning spaces even more gravitas. Award-winning, internationally published and an acclaimed product designer, Mary McDonald has well and truly made waves in the industry. The Los Angeles-based interior designer looks to the past, present and future to create elegant, modern spaces, curated with an eye for distinctive materials, textures and finishes. A fine artist when it comes blending colours into room schemes, McDonald’s projects can vary from a vision of beautifully tonal palettes (this cool, muted scheme is a perfect example) to an array of dramatic colours that clash with just the right oomph. She’s known for bringing interiors to life with ‘premeditated whimsy’, often embracing artwork to add a personal, playful touch. There’s also a powerful sense of symmetry in her work, which offers balance and calm. 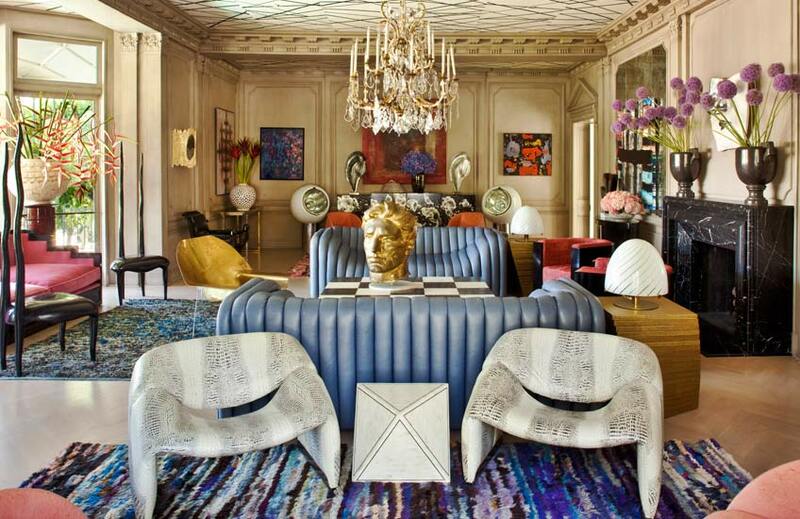 Miles Redd is undoubtedly one of America’s leading forces in interior design. 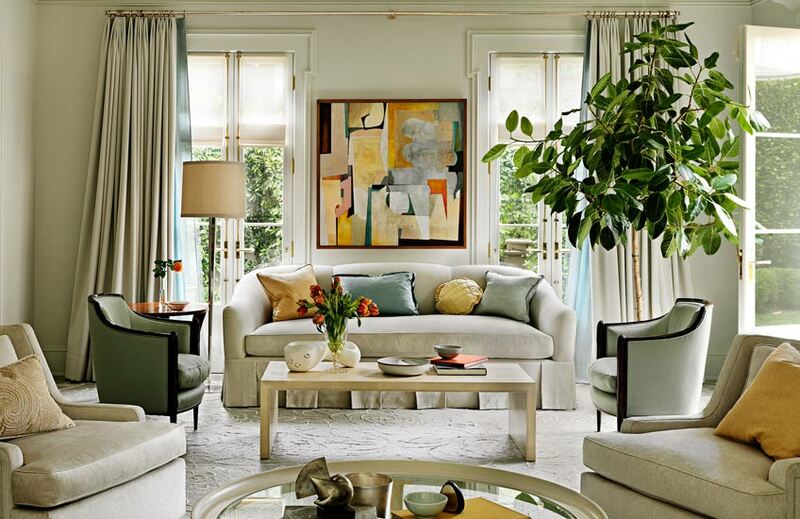 The New York-based interior designer began his journey into the industry after graduating from NYU, then refining his skills with esteemed antique dealer John Rosselli and legendary interior designer Bunny Williams. In 1998, Redd opened his own design firm in New York City and moved onto the role of creative director of Oscar de la Renta Home from 2003 to 2013. Every interior he touches has a distinctly ‘Miles Redd’ feel, branded with his trademark splashes of colour, modern gestures and quirky glamour. 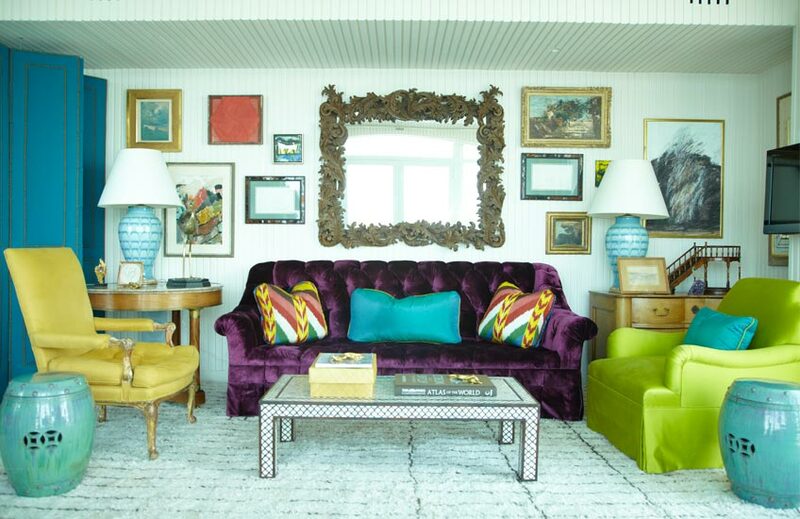 Redd takes spaces into a brighter, braver, whimsical world that we all want to visit, so it’s no surprise that editors at the likes of Vogue, Veranda and Architectural Digest never tire of featuring his wonderful work. 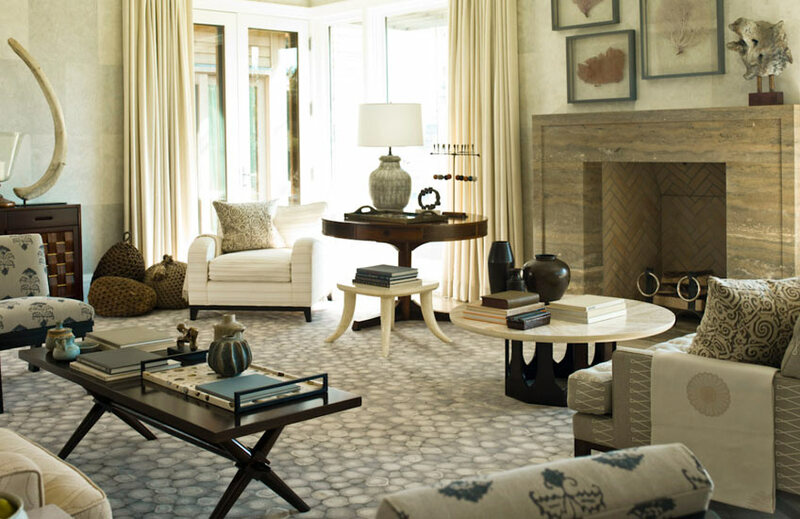 Steven Gambrel’s eponymous interior design firm stands apart for its sensitive attention to architectural details of properties and their surrounding geography. The studio was founded in 1996 (just three years after Gambrel graduated) and specialises in residential and commercial projects. Beautiful proportions and carefully curated vintage, antique and custom-designed furniture pieces are constants in Gambrel’s work, which is driven by a passion for creating timeless, comfortable interiors that grow old gracefully. This neutral lounge – found inside a contemporary New York beach house – is filled with a conscious mix of distinctive materials and unique accents to contrast the property’s large glass walls and understated architectural elements. Dark woods, exquisite surfaces and interesting instances of print add character to the room’s modern foundation. The matriarch of American interior design, Barbara Barry has been an unwavering influence in the industry since forming her studio in Los Angeles in 1985. Raised in a family of painters, Barry’s eye for subtle nuances in colours and natural forms was honed from an early age. Throughout out her career, nature has remained the designer’s ultimate source of inspiration, demonstrated here in this fresh interior awash with a meadow-inspired palette of gentle green and buttercup yellow hues. Aside from being the brains behind an extensive portfolio of residential and commercial projects, the creative is also a product designer and has collaborated with top industry’s names, including Visual Comfort and Global Views. Whether it’s a chandelier or Californian home, Barry’s concepts are resolutely elegant; rooted by classic silhouettes, raised by alluring accents and pops of colour. Windsor Smith creates beautifully layered rooms that have caught the attention of influencers in the entertainment and business worlds. The Santa Monica-based interior and product designer redefines the home for modern day living, creating spaces that echo the individual personality of its inhabitants whilst catering for the demands of 21st-century lifestyles. Her interiors are never short on elegance, and they balance both classic and modern elements. Demonstrating her signature look, this grand space marries traditional parquet wood flooring and charming wall panelling with what Smith likes to call ‘style wildcards’ – those power pieces that promise to get noticed. Whether it’s a zebra hide rug or a luminous cello, these are the additions that give Windsor’s interiors unmissable impact. “I believe your home should tell your story. What you love most collected and assembled in one place.” This is the motto of Nate Berkus, the Californian-born interior design who established his award-winning design firm at 24 years old. From Milan to Mexico and Manhattan, the creative applies his approachable, elevated design philosophy to spaces across the globe. His client list includes the likes of supermodel Karlie Kloss and celebrity colourist Rita Hazan, whose home he curated in collaboration with his talented husband, interior designer Jeremiah Brent. This living space resides in a Chicago high-rise that Berkus peppered with antique French furniture and contemporary accessories. Deep blue upholstery and yellow accents meet sleek lines to create rich yet modern results.